For more than 40 years, the Chicago-based artist has made it his mission to paint black figures into the canon. FROM THE HISTORICAL sense that, throughout the American experiment, very little has been possible for black people; to a generational sense that, despite a great deal of change in American society through time, a great deal still isn’t possible; to Marshall’s personal sense that, nonetheless, everything is possible: That’s the short version of the story that his work has been telling — mostly in paint but also in sculpture, photography and installations — since he became the first member of his family to go to college, graduating from Otis College of Art and Design in Los Angeles in 1978. In that interval, Marshall has become a preeminent American artist, one whose work is in the permanent collections of the Smithsonian, the National Gallery of Art, the Art Institute of Chicago, the Metropolitan Museum of Art and a dozen other major American museums. 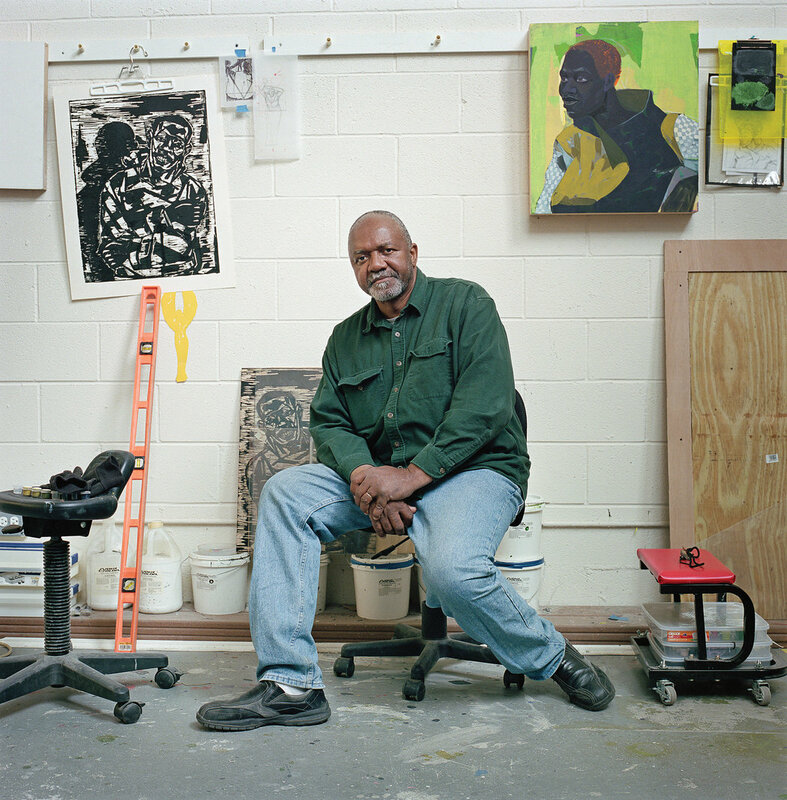 He has received a MacArthur fellowship and his paintings can command over 2 million dollars at auction. This past spring, Marshall’s career became the subject of its first major retrospective, a chronological march through 35 years of extraordinary creation, a vast show that opened in Chicago at the Museum of Contemporary Art and moves to New York this week — opening at the Met Breuer on Oct. 25 — before its final stop in Los Angeles, at the MOCA, next year. Let’s look at the very first painting you come to in the show, one that Marshall made when he was 25, a painting called “A Portrait of the Artist as a Shadow of His Former Self.” The first thing you notice is its size — 8 by 6½ inches — small by any measure but particularly so given the monumentality of the paintings Marshall has become famous for since. From this small vertical surface, seen as if in silhouette, a black face stares. Male, wearing a wide-brimmed hat and a heavy coat, he’s all eyes and grin. Literally: The only features that one can discern in this carbon-black face are two cartoonishly white eyes and, rooted in dark pink gums, 18 large white teeth with a gap dead center, a top incisor mysteriously gone, a void in a face that, in its way, is itself a void. In Chicago, I watched one museumgoer after another walk up to it and reflexively smile back, and I can report — as one of those people — that you get an odd feeling when you do, the sense that you shouldn’t be smiling. For the only other pictorial detail on that little canvas is a bright white glimpse of shirt peeking out from the general darkness, and the funny thing about the shirt is that if you stare at it long enough, its sharply drawn dimensions finally snap into focus: It looks like the blade of an axe, one poised at the neck of that huge, haunting, gap-toothed smile. This portrait of the artist as a shadow of his former self looks like something out of minstrelsy, a white actor in blackface. What we have before us is a portrait of a black man by a black man, but one that looks the way a black man might feel about being looked at in a white world by people who see, in the face of a black man, not a person but a shade, a shadow, a pigmentation: blackness. “Everything changed when I made that painting,” Marshall told me in his studio this summer. Marshall, still powerfully built at 61, with short-cropped hair going gray and a tidy beard gone grayer, is a large presence in this large set of workspaces, some 2,200 square feet on two floors. We were speaking upstairs, in front of an angled drawing board to which several works in progress were pinned: the beginnings of a plan for a large canvas, mapped out on a grid in linear perspective, a figure in the foreground, a window at the rear; a small storyboard for a series of comic-strip panels that will be blown up into enormous lightboxes; and an ink-wash study for a portrait of a woman smiling, a woman who stands in a gallery before what looks like the very portrait before us, the smile on her face as unburdened as the smile on the 1980 portrait was haunted. In the large paintings for which Marshall has come to be known, art history is always part of the picture, if not as corrective, then suggestively. “De Style,” 1993, spanning over 8½ by 10 feet, frames five black figures in a barbershop, a barber working an electric clipper at a client’s head. If the content of the scene sounds Rockwellian, to an extent it is: a modest scene from quotidian black life, one altogether different from the miserable bulletins that make the evening news. And yet the style is anything but Saturday Evening Post. The barber’s hand is benedictively raised behind his client’s head, his own head emanating rays of light in a nod to the Flemish masters, their images of beatification. The painting’s background is subtly sewn through with the rectilinear blues and yellows and reds and white of Mondrian’s work, to which the painting’s title playfully alludes. “The Lost Boys,” from the same year, represents a further pictorial permutation of that answer, a canvas of similarly large scale, in which two black boys, one holding a pink water-gun, another sitting in one of those 1-dollar car rides that vibrate outside of supermarkets, or did. The painting’s foreground features a tree whose trunk is rung with yellow police tape that’s snaking its way toward the branches, branches blooming with a strange sort of fruit, yellow bullets glowing as if with inner light. The snaking tape makes visual allusion to Michelangelo’s “Fall of Man” in the Sistine Chapel, Satan’s snake ensnaring Adam and Eve before their expulsion. Marshall’s painting depicts the instruments of these children’s possible martyrdoms — guns and cars — adult machines that have hurried too many young black boys to their untimely falls from both innocence and life itself. Marshall has called this painting a “kind of a memorial painting to lost innocence,” but it’s also a monument to an idea of a painting as a thing that needed not to be looked at so much as read. So what was he doing it for? We drove on, Marshall taking us through the intersection of Pershing and Indiana a few blocks north, and I recognized it as the vista that appears in his 2003 painting “7am Sunday Morning,” an urban landscape painting with, in its blurred passing car, a nod to one of Marshall’s favorite painters, Gerhard Richter, but which moreover showcases the real storefronts of Rothschild Liquors and, adjoining it, Your School of Beauty Culture, the latter of which I stared at in something like wonder. Closed and unappealing from the outside, its interior is depicted in Marshall’s extraordinary 2012 painting, “School of Beauty, School of Culture,” a companion to “De Style,” the two making a diptych of a kind: two intimate spaces in which men and women reimagine themselves, paintings that themselves reimagine what a black life looks like from the outside. We were parked in front of a pretty, two-story red-brick home that Marshall and his wife, the actor Cheryl Lynn Bruce, have shared for nearly a quarter century. They bought the 100-year-old structure in 1992 for $15,000 — its plumbing and electric looted, its roof rotten, its interior walls in decay. But Marshall, upon seeing it for the first time, said: “I think we can do something with this.” The couple spent many years doing the demolition, the reconstruction, making it habitable, making it lovely. I asked if I could ask a dumb question. “Yeah,” Marshall said, before he led me inside, where we visited with his wife, stepping out into their back garden, appreciating their tomato plants, their flower beds, tasting the last of the mulberries on their tree, Marshall finding a dead junebug (“You don’t see these that often in Chicago. We used to catch ’em and wear ’em like a scarab.”), appreciating its shining metallic carapace, green and blue and silver in the light. 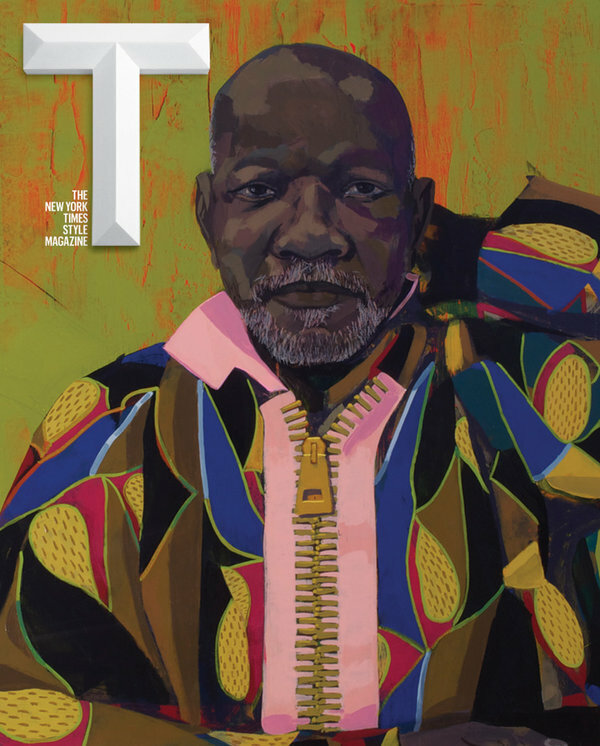 Kerry James Marshall is featured on one of the covers of T’s Oct. 23 Greats issue. A bit later, we sat at a restaurant and spoke more, but I was distracted by the recollection of what we’d just seen, a derelict city overgrown with grass. It reminded me of a picture in Marshall’s retrospective, one that I was now seeing in a new light. Called “Vignette,” from 2003, the title references paintings by the French Rococo master Fragonard, paintings in which romantic love is celebrated. In Marshall’s version, a black man and woman, naked as in Eden, with the exception of an Africa pendant worn by the man, run against a background of high lush grass, trees in the distance, birds and butterflies soaring around them. I’d read the picture as a — what? I’m not sure — but certainly not an urban scene. And yet, there in the foreground left of the huge canvas was a fringe of concrete. These lovers, these pure hearts: They were running in Englewood, being chased, or chasing. Where were they going? What could they hope for? I suggested that optimism was a kind of hope. Previous PostSALMAN RUSHDIE, in conversation with Richard Wolinsky, at Montalvo Arts Center, Saratoga, Ca., May, 2007, 77 min.Next PostRobert Storr,Peter Schjeldahl and Mark Stevens & Elizabeth Murray in conversation with Michael Kimmelman, Charlie Rose, 2002, 36 min.